Christmas just wouldn’t be Christmas unless there was a tray of sweet little Gingerbread men baking in the oven. A wonderful gift idea is to use this Recipe for Gingerbread Cookies and put it in a jar for busy moms who love to bake homemade but could use a little help pulling together ingredients. It’s also perfect for teachers who would love the taste of fresh baked cookies but lack time. Delicious and full of the taste of the holidays these cookies are sure to put two times the smile on everyone’s face, once while baking and again while devouring them. The are equally delicious with a steaming cup of coffee or a glass of ice cold milk. 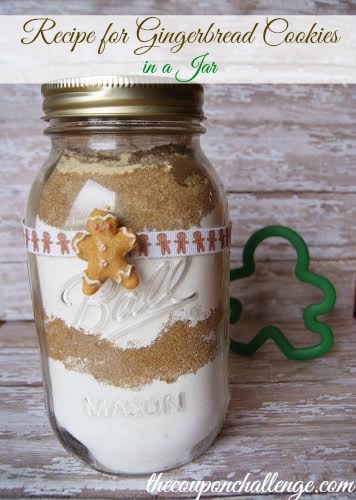 Layer in a quart sized mason jar and add a pretty ribbon and handmade label with baking instructions, don’t forget to attach a cute Gingerbread cookie cutter or two to finish them off! Place lid and ring on the jar and close securely. Top your gift with fabric tied in raffia or twine or cut festive scrapbook paper using your mason jar ring to trace for a topper – add ribbon and a handmade tag for a thoughtful gift. Place cookie mix in a large mixing bowl, stir well. Stir in ¾ cup of molasses, ½ cup butter-softened, and 1 egg. Mix thoroughly. Cover bowl with plastic wrap and refrigerate to firm up dough for one hour. Roll dough out to ¼ thickness on a smooth surface that has been lightly floured. Cut shapes from dough and place on lightly greased baking sheet. Start with sifted powdered sugar in a small mixing bowl, add vanilla, cream of tarter, and water 1 Tsp. at a time until desired consistency is reached. Place in an icing bag and pipe onto cooled cookies. * Frugal icing tip – Use a ziplock sandwich bag, after filling the bag snip off a small corner, squeeze bag gently as you go. This is also much simpler for cleanup-just toss the baggie when done! What do you think of this Recipe for Gingerbread Cookies?